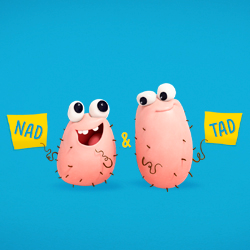 The Testicular Cancer Foundation (TCF) is announcing a new campaign featuring two animated testes, Nad & Tad, to jumpstart a conversation about the importance of self-exams and checking for testicular cancer. Launching during Testicular Cancer Awareness Month, the humorous campaign targets men ages 15 to 34, those most commonly affected by the disease. With incidence rates on the rise, testicular cancer often goes undetected due to a lack of education on why and how to proactively screen for symptoms. “Nad & Tad-ify” Yourself on Snapchat: During the month of April, Snapchat users can create a personalized Nad & Tad video. Life as a testicle never looked so good. Unlock the lens here. TCF was founded by Ferstler, who was diagnosed with testicular cancer at the age of 22. Frustrated that he didn’t know the warning signs, the importance of a self-exam, or that he was susceptible to this disease, Ferstler turned his frustration into action. In 2009, the Testicular Cancer Foundation was born and has since been a driving force in the men’s health and testicular cancer arena. “We are beyond excited about our partnership with Patients & Purpose and the ‘Get in Touch With Your Testes’ campaign. With Nad & Tad’s help, we have the potential to reach a huge audience and educate them on the importance of self-exams. It also doesn’t hurt that these dudes, if I can call them that, are hilarious!” said Kenny Kane, TCF CEO. The Testicular Cancer Foundation provides education and support to young men to raise awareness about testicular cancer. TCF also supports families of testicular cancer patients and shares its resources with the medical and healthcare communities, schools, and various young men’s groups. Patients & Purpose is a full-service, award-winning agency dedicated to patients and marketing health brands. They are multichannel experts, with deep emerging technology expertise, and develop novel approaches to patient and consumer engagement. Patients & Purpose is the go-to patient agency for Omnicom Health Group. For more information, please visit http://www.patientsandpurpose.com. Aardman Nathan Love is an innovative animation, design, and development studio located in NYC. Driven by a passion to tell great stories and connect with audiences around the globe, Aardman Nathan Love develops memorable characters, imaginative worlds, and engaging narratives for television, film, interactive, and more. Founded in 2014 and located in the Bronx, Gun Hill Brewing Company is dedicated to bringing high-quality, hand-crafted beer to the people of NY.